I took a couple of days off from blogging after reaching Key West, so we’ll resume by my keeping not one but two promises. I said here [linkie] that I would do one final trip weigh-in on the 10th in KW to give me a close the record number. I did that, stopping at a handy Publix on the way back to the hotel from Mallory Square. Ready? I missed catching my feet, but you can see their reflection on the scale, to include the hole my right foot big toe wore in my bike sock. Two eighty-five (~129 kilograms) on the nose! As my first official weight of this whole undertaking, noted here [linkie], was 367 pounds and change/166 kg, I have lost somewhere in the neighborhood of 80 pounds/~37 kg over the past four months. Now, I’ve learned that scales along the trip have not been exactly measuring atomic weight to six digits after the decimal point, but hey, I’ll take “the mid-280s” as a solid start point from which to defend The Battle of the Bulge. Maybe I can even stay on the offensive. Stranger things- anyone up for a 3,500 mile/5,600 kilometer bike ride?- have been known to happen. Oh, and I think my friend Fred won the “Guess My End Weight” contest. The second promise is a little harder to keep. OK, OK, it’s a lot harder to keep. But I said I’d do it here, so here goes. You’ll remember that this trip was originally going to start in Jacksonville, Florida. On the first day just before leaving I walked myself into a bathroom and took a selfie of my stomach flab. I cautioned folks then that it wasn’t pretty. I said that I would take a comparable pic at the end of the ride, and we’d see what happened [linkie]. Once again, you’ve been warned. 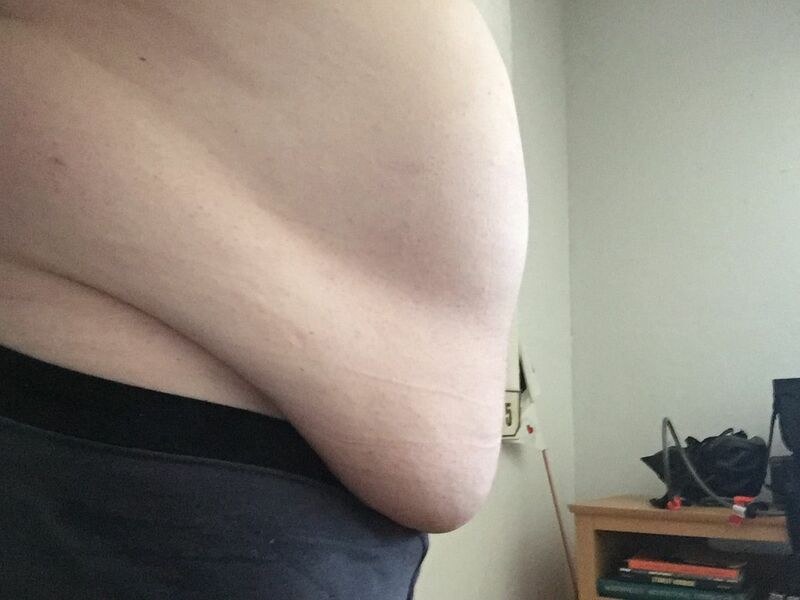 Belly fat is not pretty. 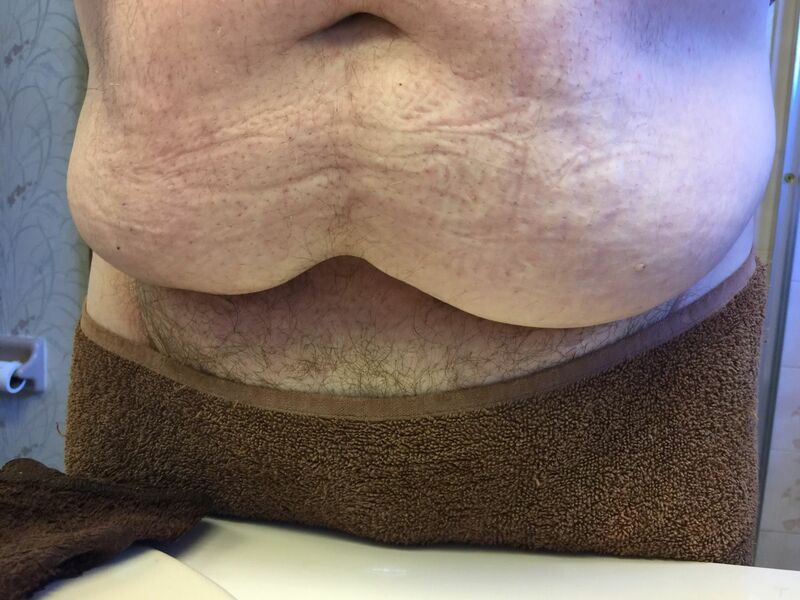 I don’t know if what mine looks like will ever improve beyond this point, or if I’m just condemned to look like Jabba the Hutt’s third cousin down there for the rest of my life. But my waist size in pants has gone from 56″/142 cm to 46″/117 cm. Looks good. I lose weight during the winter simply because burn more calories to maintain body temperature. Note year round I only spend maybe 8 hours a day in a climate controlled area. My first recording was June 27 at 357.2 lbs, my last is 11/10 at 285. So a total ride loss of 72.2 lbs. I am not sure if that is from your final Alaska weight, first Florida weight or the First Canada weight. In either case that is a lot of weight to lose in such a short time. For the time I have data you have lost 0.52 lbs/day with a variation from the linear trend of ±3.2 lbs per weighing. Looking at one of the on-line BMI calculators it says for your age to get into the top of the low risk from weight range you need a BMI of 28, which if I remember your height correctly is 230 lbs. So if you can move from the very rapid weight loss of intense exercise to a slightly slower 1 lb per week you can be down to the top of the ideal range in about a year. I need about 2 years, yes, I am still very fat, although not as bad as I was. You’re going to need a 2nd bike. An Alaska bike. Maybe one with the big Alaska tires for riding across the snow. Or just an solid mountain bike, so you have good traction. (Skip the suspension, just a hardtail. Suspension dissipates your work.) Save your nice road bike for the summer months. I bet it would also be valuable for readers if you post info from your next doctor’s visit, showing cardiovascular parameters, blood lipids, fasting glucose, and any downward adjustments in medication. I’m also curious if you’re feeling any difference in your knees yet. Well done! And you look much better. I am sure you feel much better. Stay active, enjoy the new you, and keep at. Ha! Nailed it! [285 was my guess] Congratulations, David, tremendous achievement in making the ride, and you documented it in a fantastic way as well. OK, not-so-big-boy, you have had enough time to adjust back to home life. You owe us some more posts about your trip. Chop chop!